Join us on Saturday, June 23rd for the second annual ‘Ice Cream Ride’. This year riders can choose from two exciting routes! The Single Scoop - this family friendly, accessible and car-free 6 km route runs along Hamilton's Waterfront Trail from Bayfront Park to Princess Point and back. Click here to see the 6 km route. The Double Scoop - this 29 km route follows bicycle paths and bike-friendly roads from Hamilton's Bayfront Park to Burlington's Spencer Smith Park and back. Click here to see the 29 km route. 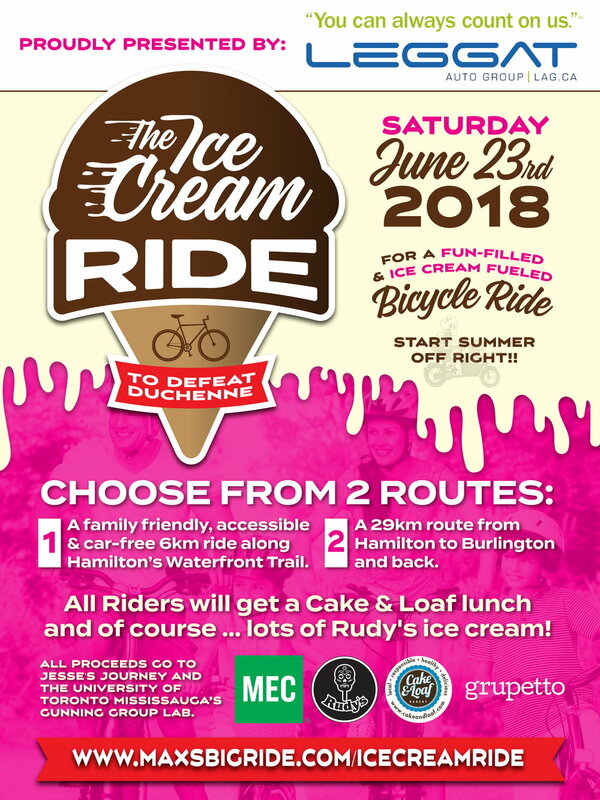 You won't ride away hungry as we'll treat all riders with refreshing frozen paletas from Rudy's at the halfway point, a tasty lunch catered by Hamilton’s amazing 'from scratch' neighbourhood bakery, Cake and Loaf using veggies from awesome Plan B Organics - plus more delicious ice cream at the finish line! All riders are encouraged to collect pledges from family and friends. Our highest fundraisers will be rewarded with a range of prizes from amazing local businesses. Your help could make this generation the first to survive Duchenne muscular dystrophy. All proceeds from registration will go to help find a cure for Duchenne muscular dystrophy via the registered charity Jesse’s Journey. This year we are fundraising for Max's Big Fellowship - an amazing partnership with the Gunning Group Lab at the University of Toronto Mississauga. In addition, we are encouraging all riders to gather pledges from their family and friends to help fund this all important research. When you register for the ride you'll be invited to collect pledges from your family, friends and colleagues. As a way of saying thanks for your fundraising help, we have partnered with some amazing local businesses to offer prizes for our top individual fundraisers. Rousseau House Restaurant - $100 gift card! Mountain Equipment Co-op - $100 gift pack featuring an ice cream ball, 2 pairs of tech cycling socks, 2 packs of nuun, and a Pop rear cycling light! Duchenne muscular dystrophy (DMD) is a progressive and fatal genetic disorder that gradually weakens the body’s muscles. Because the Duchenne muscular dystrophy gene is found on the X-chromosome, it primarily affects boys and it can occur in all races and cultures. Most boys with DMD are using a wheelchair by the time they are 12 and many don’t survive their mid-20’s. Although there is no cure available right now, scientists have made great progress on many fronts. Doctors are working on improving muscle and joint function, and slowing muscle deterioration. Together with your help, The Ice Cream Ride aims to help change the future for boys with DMD. Click here to register for The Ice Cream Ride.